During the Gold Rush, the massive arrival of gold seekers made this area known by the rest of the world. 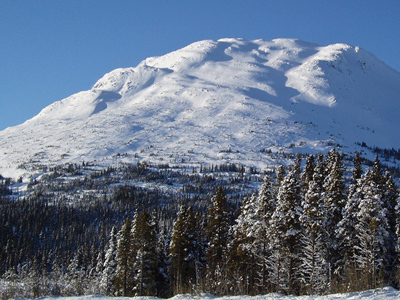 Nowadays, the Chilkoot Pass area retains its natural and untouched beauty, and many more people visit the area. Skiers will find here the white gold they are dreaming of. In the middle of the Coastal Range, the White Pass ares is in between the interior continental Yukon Plateau and the Alaskan Pacific Coast. By the road you have access up to 1000 meters of elevation, most of the peaks in the area are close to 2000 meters in elevation, which is not that much but because of the high latitude you are really in the alpine, with glacier coming down to low elevation. The geographic location, between the Pacific Ocean and the continental Yukon Plateau provides typical cosatal weather. Wind can be pretty nasty sometimes but it is possible to ski from december to may. If you are looking for avalanche forecasts for the region the Canadian Avalanche Centre publishes regular bulletins and there is also a Yukon Avalanche Association web site with plenty more information. We want to hear about your backcountry skiing adventures in the White Pass area of the Yukon so don’t forget to post a trip report in the backcountryskiingcanada.com forums. If you have a new route in the area you want to share, mouse-on over here. N-Joy. All routes listed here provided by Claude Vallier of yukonbackcountryskiing.com. If we have missed anything please let us know? This small summit is very accessible. The low elevation and the smooth slopes make it a perfect spot for learning or for snowshoeing. There is also a nice panoramic view of the area from the summit. During spring skiing, it's a very nice sector to ski. By choosing your route accordingly, it's possible to significantly reduce your exposure to risks of avalanche. Be careful and watch out for a few breaks in the slope and a few counterslopes. A good part of the route is visible from the road and the parking area. From the parking lot, go through a flat area to reach the East slopes, which should only take a few minutes. Stay on the right side of the obvious canyon east of Summit Creek. Make your way over the small valleys and ridges to reach the summit. This is also the time to identify the best slopes for the descent. Early in the winter, with little snow cover, the small valley is well surrounded and gets filled with snow quite fast and allows skiers to ski without fear of hitting rocks. However, watch out for a few holes formed by the wind next to the rocks and the small rock walls. To extend your route a little, it's possible to ski on the North slopes, as they often have some good snow. Be careful with the canyon and a few small cliffs. It's a good backup route in case of avalanche conditions in other sectors, because it's easy to find a safe route. From the parking lot, cross the road and hike up on the road to the North for about 50 meters to find the trailhead that leads to Fraser Lake. In the beginning, in the forest, the trail follows a gentle slope. After a few minutes, you arrive at a trail crossing. Take a left to head on the trail that keeps going up (outcrop). Stay on that trail until you reach the lake (easy). After that, two options are possible: You can climb up the North face to reach the couloir by a long ascending traverse, after which you climb up the couloir on skis and the rest on foot. 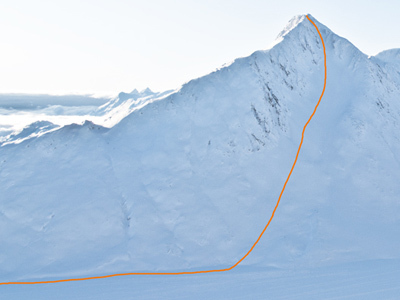 Otherwise, you can climb towards a small pass that allows you to reach the East ridge which you follow all the way to the summit, on skis at first and on foot later (crampons sometimes useful). The higher section of the couloir can sometimes be crowned by a significant overhang, but we can easily go around it. The summit is quickly reachable on foot, and it offers a big flat section. The beginning of the descent is the steepest part. 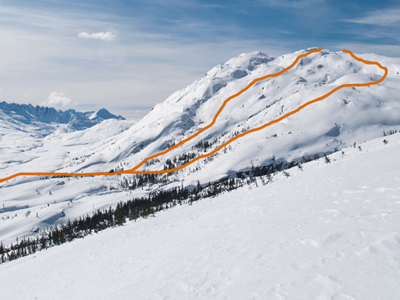 After a few meters, the slope becomes smoother; the couloir gets narrower for a short distance and then the slope opens up wide and stays regular almost until the bottom. Usually named Mount Log Cabin, it is also named Shallow Peak or Sunrise Peak on certain maps. It’s one of the most frequented area, particularly the Northeast face, which is one of the most classic routes in the region. Follow the trail that goes along the road at the South end of the parking towards the forest. At the end of the trail (approx 300 meters) follow the cut line in the forest going West. This allows easy access to the tree level (spot the exit for the return). From the upper tree level, go forward following outcrops and valleys to get on the West shoulder after going through a small valley. From there, a little more effort up a small slope and you are at the summit. Going down, you can choose your route on the West face according to the snow conditions and the avalanche risk. In general, we avoid skiing too far West of the forest access point where we came up. We can then avoid a difficult return on the flat in the forest, which sometimes requires putting the skins back on. By skiing further east, holes in the vegetation allow skiers to ski easily almost all the way down and be guaranteed to cross the path used when ascending, which makes for an easier return to the parking lot. We often find the best snow just above the tree level. It’s also a fun area to ski when the visibility is bad, as the sparse vegetation offers a nice playground.